Kaia Gerber was all legs at the Omega Trésor watch launch held in Kraftwerk in Berlin, Germany on Wednesday. The newest It girl put her impossibly long limbs on display in a Versace Spring 2018 Tribute silk topstitch mini-dress featuring Medusa medallions on the straps and bustline. She matched her LBD with Versace Tribute collection Medusa-medallion ankle-strap sandals previously worn by Katy Perry. Details of the Versace Medusa-medallion ankle-strap sandals on Kaia Gerber. Kaia sure has come a long way in such a short span of time. Once only modeling alongside the rest of her family for Omega, the Cindy Crawford spawn is now herself the face of the entire Omega Trésor collection campaign. Kaia Gerber, Rande Gerber, Cindy Crawford and Presley Gerber star in the Omega “Her Time” campaign, which celebrates the 22-year partnership between Omega and Cindy Crawford. 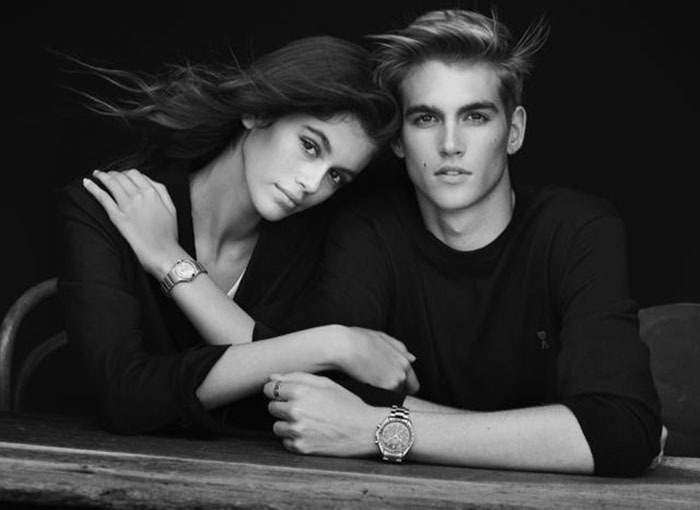 Siblings Kaia Gerber and Presley Gerber starring in the Omega “Her Time” campaign. Kaia was already showing her potential as a brand ambassador at the “Her Time” Omega photo call held during the last Paris Fashion Week Womenswear Spring/Summer 2018. The genetically blessed teen was resplendent in a Philosophy Di Lorenzo Serafini Fall 2017 strapless dress with lines of crystals embellishing the high-low tulle skirt. Adding a bit of edge to her look were Jimmy Choo “Tower” mesh pumps, a black leather belt at the waist, and the Omega Constellation watch. The Gerber family, Presley Gerber, Kaia Gerber, Cindy Crawford and Rande Gerber, at the “Her Time” Omega photo call held during Paris Fashion Week Womenswear Spring/Summer 2018. Presley Gerber and Kaia Gerber posing together at the “Her Time” Omega photo call. See how Emma Stone and Daisy Ridley styled their own Jimmy Choo “Tower” pumps.